eBay launched its long anticipated search platform on eBay.com sometime in June. Hugh Williams told Wired magazine the marketplace had quietly rolled out Cassini this month to U.S. users, but no reason for the stealth launch was provided, despite eBay's commitment to notify sellers when implementing any business-impacting updates. 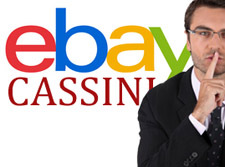 eBay spokesperson Ryan Moore told EcommerceBytes on Tuesday that Cassini was "now fully serving U.S. customers." As we previously reported, eBay had been testing Cassini to a subset of U.S. users since December, and Cassini had been powering null and low search results and completed-item searches as well. In posts on his personal blog, and in a recent webinar, Williams provided some information about the new platform. One feature Williams seemed willing to talk about was Cassini's ability to search the description field of listings - the previous search engine searched only titles and catalog data. "Sellers will no longer have to rely on the title to ensure their items get visibility," he has said. Williams came to eBay from Microsoft where he worked on using behavioral data in web search ranking and query alterations. Cassini is expected to eventually use behavioral data to make assumptions about listings and about buyers - not just whether listings are clicked on and if those clicks result in bids or purchases, but information about what buyers have purchased in the past. That is not an area Williams has addressed, and it would certainly make it more difficult for sellers to measure their visibility in search if each searcher sees different results when entering the same search term. Online merchants have been analyzing their analytics and some have speculated that Cassini had already launched long before Tuesday's announcement based on traffic to their listings. Even the eBay communications team seemed caught off guard by the news of Cassini's launch - in blogging about the news later in the day on Tuesday, it quoted the Wired article as its only source of information about the new platform launch.